Chicago Mailing Tubes (CMT) offers 4.000" x 42" heavy-duty kraft tubes with plastic caps. 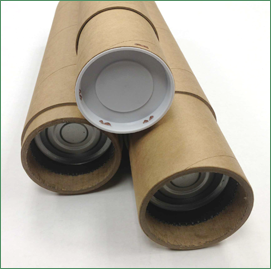 Our kraft mailing tubes are extremely sturdy, durable, and efficient for your business shipping needs. Our snapping tube caps will not pop off during shipment; we ensure that your contents inside will deliver safely. Our heavy-duty kraft tube are inexpensive and serve as a reliable method to ship all of your commercial, industrial, or personal products for your business. Chicago Mailing Tube is entirely operated in one, cost-efficient location. We manufacture with top quality equipment to ensure every mailing tube is top quality. Because of our flexible production capabilities, we can meet 24-hour shipping deadlines for our customers. Contact our service representatives today at (312) 243-6050 to speak to one of our service representatives about ordering your 4" x 30" heavy duty kraft tubes. No minimum order is required!